State Farm​ is in at least one prominent, sprawling U.S. metropolitan area assigning revised “prevailing” auto body labor reimbursement rates to shops based on the businesses’ federally defined metropolitan area boundaries, a trade group has told us. Shops have reported both higher and lower rates following the conclusion of State Farm’s efforts. One state trade group we’ve agreed to keep anonymous has reported being told by State Farm that the insurer was applying the Office of Management and Budget’s “core-based statistical area” to a major urban area of the state. Such classifications are used by entities such as the Census Bureau for statistical work and other purposes. We want to stress there’s no confirmation that this is what State Farm is doing nationwide; the insurer refused our request to define the “government defined market area” term. But if this is indeed happening in other states, here’s a little context and food for thought. The federal government recognizes two types of “core-based statistical areas”: metropolitan and micropolitan. Metropolitan areas have an urban core of 50,000 or more people; micropolitan ones have an urban core of between 10,000 and 49,999. Get a list of all “core-based statistical areas” here. Get a map of all “core-based statistical areas” for the entire country here. If State Farm treated each micropolitan area separately with regards to labor rates, it would at least seem to alleviate shop allegations the insurer is painting giant swaths of states with the same prices. For instance, in 2011, Plaintiff Capitol Body Shop’s rates were posted as $50.00 per hour for body, refinish, and paint and materials. Capitol is located in Jackson, central Mississippi. Plaintiff Smith Brothers’ posted rates were $46.00 per hour for body and refinish and $38.00 per hour for paint and materials. (Brookhaven-based) Smith Brothers is located in the south/southwest of Mississippi, not far from the Louisiana border. Plaintiff Pitalo’s posted rates in 2011 were $46.00 per hour for body and refinish and $32.00 per hour for paint and materials. Pitalo’s is located in Ocean Springs, the extreme southern/southeastern part of Mississippi. Plaintiff Bill Fowler’s had posted rates in 2011 of $44.00 per hour for body and refinish and $35.00 per hour for paint and materials. Bill Fowler’s is located in Southaven, the extreme north of Mississippi, just a few miles from the Tennessee border. … While Mississippi’s population is relatively small, there are over 360 miles between Southaven and Ocean Springs. This is more than the distance between Jacksonville and Miami, by way of comparison. Despite this distance and variance, and the fact that no Plaintiff charged less than $44.00 per hour, State Farm had determined the market rate was $42.00 per hour for body and refinish labor and $35.00 for paint. 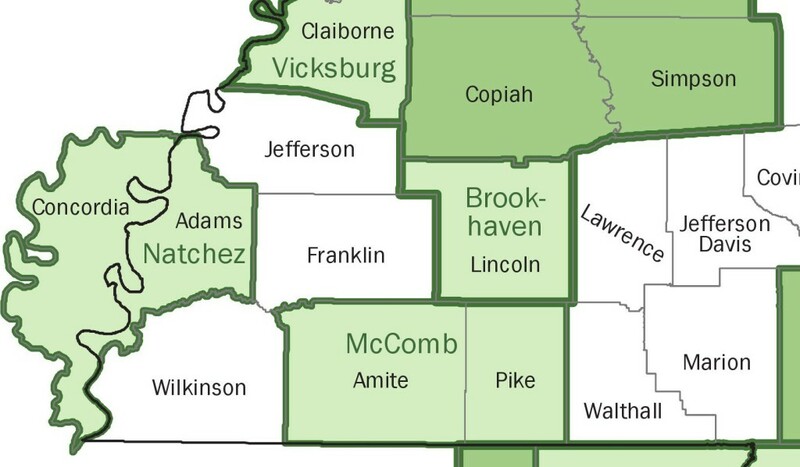 Brookhaven, Miss., and the area around it is a separate micropolitan area. If State Farm stuck to an accurate survey of solely that area and the surrounding Lincoln County and applied an “island” rate to that region, it might be a little more palatable to the plaintiff shop than identical rates across a 360-mile area with no explanation. Of course, that still begs the more important question of why not just pay a reasonably priced shop what it’s charging. In this case, it’s a $4/hour difference, not a $40/hour difference. We’d bet some State Farm staff performing similar jobs have a couple of dollars/hour difference based on merit; why shouldn’t shops? Metropolitan areas are likely to be far more controversial. Some are restricted to a single county with a large city. Others sprawl over such a large geography within a single state — or multiple states — that it becomes a stretch to think a single “prevailing rate” could be sought from all shops. In fact, the state trade group we talked to is reporting that some shops within the confirmed metropolitan region are seeing a rate increase — while other businesses are seeing rates fall. If you survey an area that large and apply a single rate to it all, as State Farm is allegedly doing, that’s not surprising. Going back to the Missisissippi example for hypothetical purposes, let’s look at Southaven, Miss.-based Bill Fowler’s. Southaven is part of the Memphis, TN-MS-AR metropolitan area, which as the name implies sprawls with the Memphis suburbs across three states. All three states presumably have different laws, regulations and licensing affecting collision repairers and insurers, not to mention geography. 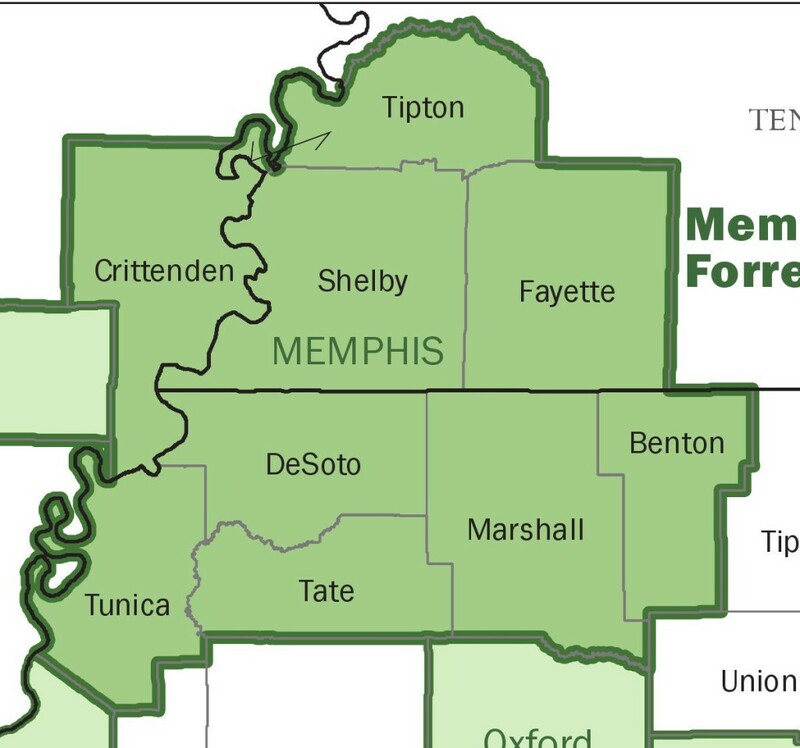 So would a collision repairer in Southaven, Miss., a DeSoto County suburb, have much in common with a shop in Covington, Tenn., located an hour north in Tipton County, even though both are part of the same metropolitan sprawl? Or with a shop in the heart of Memphis, Tenn.? Here’s other metropolitan examples which span three or more states. Look them up or your own state on the map links above and see what you think. Finally, the feds stress that these core-based statistical areas are only supposed to be used for statistical work. They even seem a bit concerned that other federal agencies might get too cute with them. So as our analysis shows, it could be problematic for the private sector as well. Thus, OMB cautions that Metropolitan Statistical Area and Micropolitan Statistical Area delineations should not be used to develop and implement Federal, state, and local nonstatistical programs and policies without full consideration of the effects of using these delineations for such purposes. These areas should not serve as a general-purpose geographic framework for nonstatistical activities, and they may or may not be suitable for use in program funding formulas. 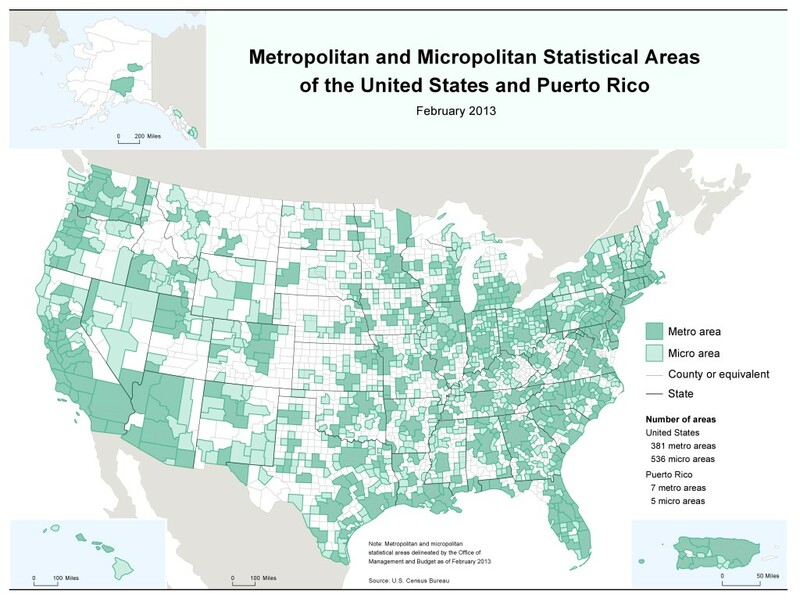 OMB recognizes that some legislation specifies the use of Metropolitan Statistical Areas for program purposes, including the allocation of Federal funds, and will continue to work with the Congress to clarify the foundations of these delineations and the resultant, often unintended consequences of their use for nonstatistical purposes. In cases where there is no statutory requirement and an agency elects to use the Metropolitan, Micropolitan, or Combined Statistical Area delineations in nonstatistical programs, it is the sponsoring agency’s responsibility to ensure that the delineations are appropriate for such use. When an agency is publishing for comment a proposed regulation that would use the delineations for a nonstatistical purpose, the agency should seek public comment on the proposed use. An agency using the statistical delineations in a nonstatistical program may modify the delineations, but only for the purposes of that program. In such cases, any modifications should be clearly identified as deviations from the OMB statistical area delineations in order to avoid confusion with OMB’s official delineations of Metropolitan, Micropolitan, and Combined Statistical Areas.